Generation Star Wars: Elite: Dangerous ain't like dustin' crops, boy! Way back in 1984, like many Star Wars fans I was craving more from that galaxy far, far away. Return Of The Jedi was a year old and little did I know this was the beginning of the dark ages in regards to Star Wars. I was never one for the expanded universe, instead getting my Star Wars fix from my Kenner figures. 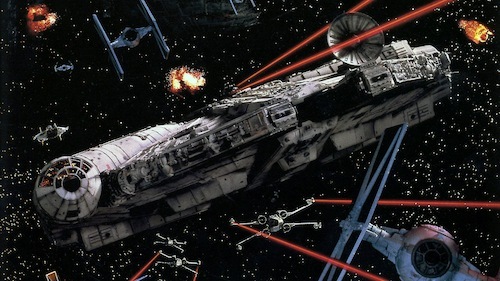 I would make up my own Star Wars story usually consisting of the Empire attempting to take control of a broken down Millennium Falcon situated in the middle of my bedroom. The Emperor would unleash his latest super weapon, Big Trak. 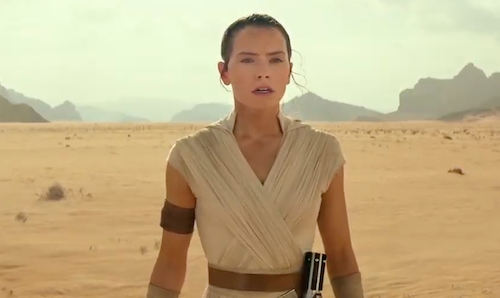 This would be my Star Wars fix and had been for a number of years. 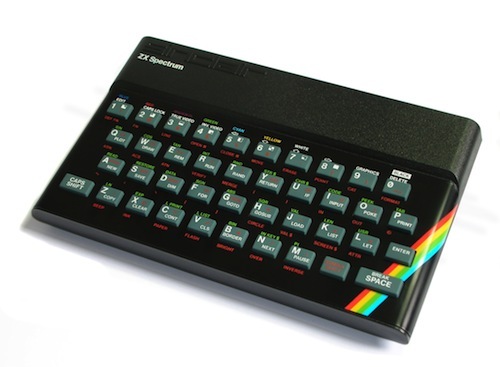 In 1984 I had my first computer, a Sinclair Spectrum 48K complete with those unique rubber keys. A whole universe of untapped gaming was in front of me and one game in particular literally had a universe to play in, Elite. The game, written by David Braben and Ian Bell was a space trading game. An open ended game where you are first armed with a basic ship and just 100 credits to your name. The aim of the game is up to you. Get more money or become famous. Fight for a faction or show no mercy to any side. The game was your game and you could make any decision…from a certain point of view. 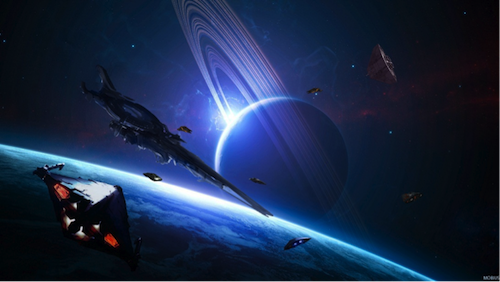 The game had hundreds of planets normally with a space station in orbit. Here you could dock your ship, (easier said than done without a docking computer) trade and pick up missions. What has this got to do with Star Wars I hear you say? Well I filled in the gaps. 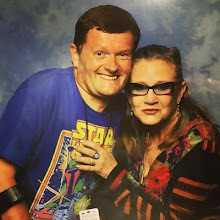 To me I was a scoundrel with my own ship just like Han Solo, trying to make a living, smuggling goods, shooting first and generally being a scruffy looking nerf herder. This game had given me exactly what I was craving. A universe where I could fly a space ship and do what I want. Being 12 years old at the time filling in the gaps and making it Star Wars related was easy. I even played my Star Wars album on my record player while playing the game. I’m smiling as I type this. I forgot about that little detail until now. Fast forward to the present and only this week my question from 30 years ago has been answered. I finally managed to get my hands on the new Elite game called Elite: Dangerous. As you would expect it boasts next gen graphics, a wonderful soundtrack performed by a full orchestra and instead of hundreds of planets there are millions of systems each containing numerous planets, anomalies and space stations. It really is mind boggling and for the first time in a very long time I am amazed at how big a video game is. Another big difference to its 1984 cousin is now you’re not playing on your own. Everyone else playing the game is sharing the same universe. If you see another ship in the game, chances are it’s another player. You want to dock at a space station? Get in line and wait for the space station to give you a slot. Other players will watch you as you dock and back seat drivers giving you advice as you get it wrong. Exactly what happened to me last night. Have you ever tried parking a car in a space while being watched? It’s twice as hard. It’s become a known fact that video games over the years have become a lot easier to play and finish. All too often the game is willing to hold your hand and guide you through a particular difficult part. Thankfully, Elite: Dangerous is still as hard and even more daunting than its 80’s counterpart. The game once again gives you a basic ship and some credits and it’s up to you to go out there, choose a star, straight on till morning and see where it takes you. There are a few tutorials but to be honest a lot of the fun is finding out what each button does and achieving small tasks such as docking, flying and navigating are as rewarding as any mission I’ve done in a game. There is combat in the game but it’s not essential at first. I’m too scared at the moment to take on any combat missions. If you lose your ship you end up back at your home base and you get punished. Your new ship will cost you and you’ll probably end up owing money for the new ship at first. So the will for self-preservation is higher than any game I’ve played in a long time. My first job involved coffee. Some workers had decided to strike due to a lack of coffee on board a space station. My job was to go out there and find some coffee and bring it back. In exchange I will get 9000 credits. Instantly I thought of Captain Janeway in Star Trek: Voyager “There’s coffee in that nebula” or in my case the next system. I plotted a course, left the station and hyper jumped to the next system to grab that coffee. It sounds easy and to be honest it was but I had to plot a course, leave my current station, hyper jump, come out of hyperspace and dock twice. It was remembering all these procedures and putting them all together. I had a sense of achievement completing my very first mission and Janeway along with her disgruntled co-workers could smile again now being full of caffeine. 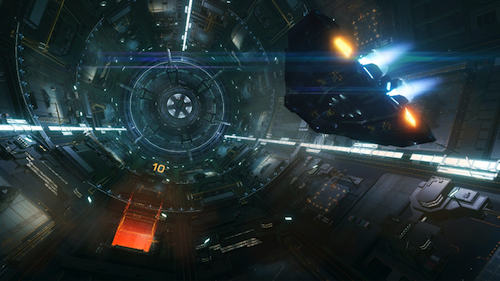 Elite: Dangerous is a game that will last and with so much to explore I will be playing it for many years. Not since Skyrim have I been able to say that. There are already updates and mods for the game including voice control. The game is compatible with the Oculus Rift too (A virtual reality headset). This makes me smile and once again I have to wonder what this kind of game will be like in another thirty years? Have your own Star Wars story to share? Please get in contact.